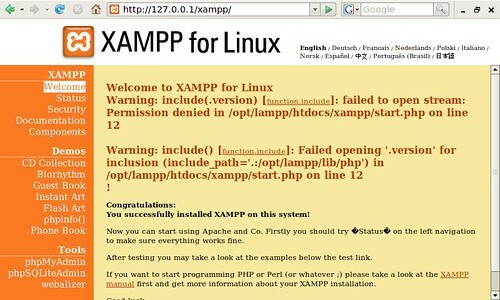 I got XAMPP installed on the Eee PC, which wasn’t difficult, because it’s Linux and XAMPP is easy. I had wanted to install it onto the SD card I leave in the machine, but installing into /home/user/SD-MMC/SD1GIG/opt did not work, so I ended up going for plain old /opt on the internal memory. The weird thing about putting it on the SD card was that I couldn’t set the execute bit on some files. I’ll have to look into that one… As it is, it’s in /opt/lampp now and pretty much works. 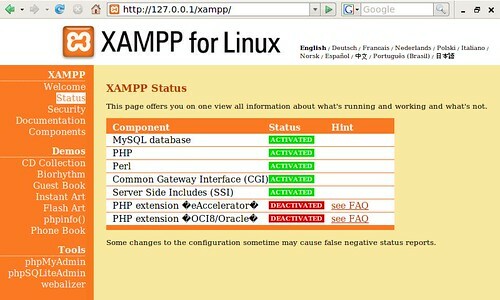 I could have installed Apache, MySQL and PHP separately, but I just wanted to get up and running quickly so XAMPP did the job. I’m hoping I’m not going to regret devoting too much space to it. I can always pare it down later if needed. 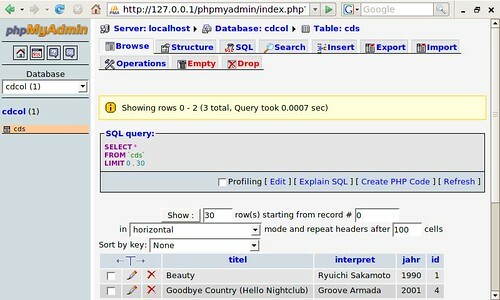 Along with XAMPP comes phpMyAdmin, which can come in handy, but on the small screen isn’t exactly optimal. Next on the TO DO list will be installing Drupal. Posted on Monday, December 17th, 2007 at 1:00 pm. Subscribe to the comments feed. Both comments and pings are currently closed. Post on your own blog.